PT GOLBAL EDU, INDIA promotes and conducts Vedic Mathematics workshops to promote the beauty of Indian origin Mathematics which helps and improves students mathematical skills, knowledge, talent and understanding. PT GLOBAL EDU has initiated, conducted and organised many workshops for school students. It has originated from “Atharva Vedas” the fourth Veda. “Atharva Veda” deals with the branches like Engineering, Mathematics, sculpture, Medicine Vedic Mental or one or two line methods can be used effectively for solving divisions, reciprocals, factorization, HCF, squares and square roots, cubes and cube roots, algebraic equations, multiple simultaneous equations, quadratic equations, cubic equations, bi quadratic equations, higher degree equations, differential calculus, Partial fractions, Integrations, Pythagoras Theorem, Apollonius Theorem, Analytical Conics and so on. Promote Indian Origin of Mathematics and aware the globe about Vedic Mathematics which is Indian origin like Yoga and Ayurveda. Promotes Indian Culture, Value and heritage by Promoting Vedic Mathematics to the students of the world. Promote the advantages of learning Vedic Mathematics which enhance overall academic and mental performance of students. Why Vedic Mathematics Training to be conducted for students? In the era of STEM skills ( Science, technology, Engineering and Mathematics) , Young people need to develop digital fluency, and science, technology, engineering and mathematics (STEM) skills from an early age if they are to be equipped to thrive in the modern workplace – and in modern society. In today’s technically challenging world, we need to ensure our children are raised with a better appreciation of math. Although math may represent the last letter in STEM (the other letters standing for science, technology, and engineering), it ranks first in importance. Most jobs of the future will require a basic understanding of math and science. Ten-year employment projections by the US Department of Labour, for example, anticipate that of the 20 fastest-growing occupations for the period between 2016 and 2026, many will require an increasing understanding of math or science. Given the importance of STEM in the growth of future workplaces, it is important to ensure access to related education to all socio-economic groups. Girls and women are particularly underrepresented within high value-added STEM disciplines. 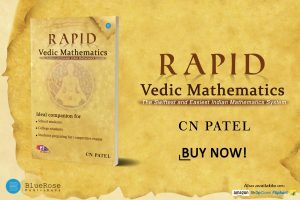 Attending Vedic Mathematics enhances students’ mental ability and mathematical skills which help students to be fast, efficient and filled with full of confidence. Having more than one way to doing a calculation gives a deeper insight and understanding of numbers. More ‘user-friendly’: it works the way the mind works. It encourages creativity and gives confidence. Very useful for school level exams like Maths Quiz Competition, NTSE, Olympiad, JEE, National & International level Scholastic Test and competitive exams like UPSC, Public Union Services Exams, RRB, SSC, Banking etc. All Participants would be awarded with the Certificate of Participation, top three meritorious students will be awarded with certificate and gift. Certificate of Appreciation for school & Appreciation Trophy for school principal if encourages more than 100 students from grade 6 onward.